In last week's episode, we talked about Johnny's hoax story about "the Cincinnati Triangle" and how it fits into our overall mission with Hold My Order, Terrible Dresser to expose the conspiratorial weirdness that exists beneath the surface of WKRP in Cincinnati. I've been thinking, if I ever did get the chance to interview Hugh Wilson as a result of putting together this podcast, the one question I would absolutely need an answer to would be, "How much did you and the other writers dig all this late-70s weirdness, and how much of it was just in the air at the time?" Because in the late 70s, America was experiencing a golden age of conspiratorial, occult, and otherwise Weird subjects. 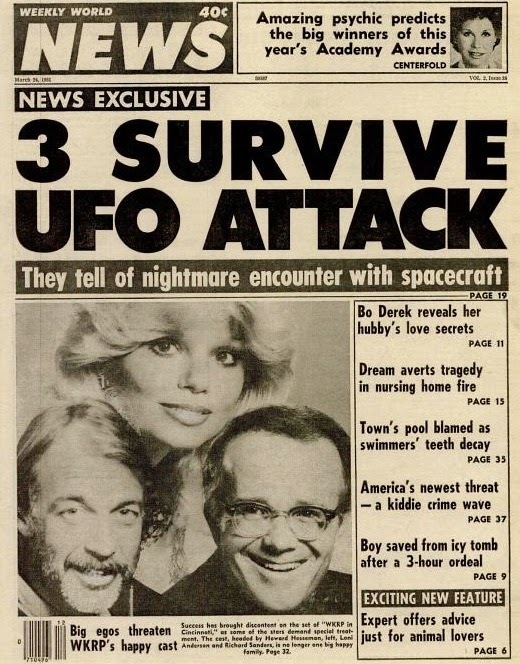 Science fiction was having one of its periodic breaks into the mainstream, not just from the overwhelming success of Star Wars, but also the success of the ur-text of late-70s pop culture UFOlogy, Close Encounters of the Third Kind (also released in 1977). Television shows like In Search Of..., itself launched as a result of the success of a couple of ancient astronaut documentaries earlier in the 70s, were successful and ubiquitous on syndicated TV. Why all this weirdness? Well, certainly a big part of it was the maturing and entry into the mainstream of various Aquarian ideals left over from the 60s. The human potential movement had broken out of the hot tubs of Big Sur and gone into the mainstream in a big way, in ways both benign and sinister. The counterculture ethos, long intertwined in America with movements like alternate religions and Theosophy, had found new and fertile ground in the societal change that continued into the 1970s, so much so that stuff like the Bermuda Triangle could be successfully mined for humor in a network sitcom; recognition by the mainstream audience at home and in the studio could occur without much explanation. The Cincinnati Triangle, then, will be the name of our regular feature on the eliptony at the fringes of WKRP's humor, the existence of an unearthly and unheimlich reality underneath the homely and familiar at a middle America radio station. We'll be diving very deeply into this in the Cincinnati Triangle segment of this Wednesday's podcast. It is time for this town to get DOWN!